The Apple iPhone can now translate phrases and speak in several foreign languages, thanks to a new talking translator application from lastminute.com . 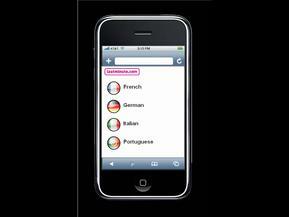 The lastminute.com Talking iPhone Translator is a free service providing travellers with text and audio translations from French, Spanish, Portuguese, Italian and German (with a Greek translation version to follow shortly). Users can select a phrase and the application will display a written translation as well as provide a spoken translation recorded by a native speaker. Users can choose to let the iPhone do the talking for them, or use the correct pronunciation to help them communicate with locals.